Alaskan Survival Knife has a 420 J2 stainless steel blade. These full tang knives measure 12 ¼ inches in all. They feature a 6 7/8th inch sharpened blade. 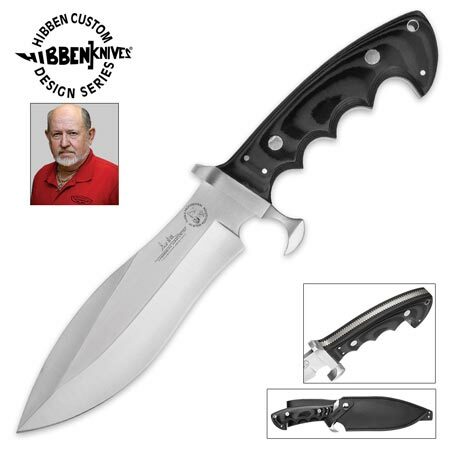 The Alaskan Survival Knife blade bears the signature mark of Gil Hibben. These survival knives also have an inscription on the blade that says Hibben Knives Custom Design. The blade is also imprinted with Alaska Professional Hunters Association. This Knife includes a custom leather belt sheath with a snap closure. Buy the Alaskan Survival Knife for $69.99. Highlander Bowie Knife has a mirror polished 420 stainless steel blade and a mirror polished pommel and guard. The blade measures 13 ½ inches in all. This popular design has an 8 ¾ inch sharpened blade. The Highlander Bowie Knife blade bears the signature mark of Gil Hibben. 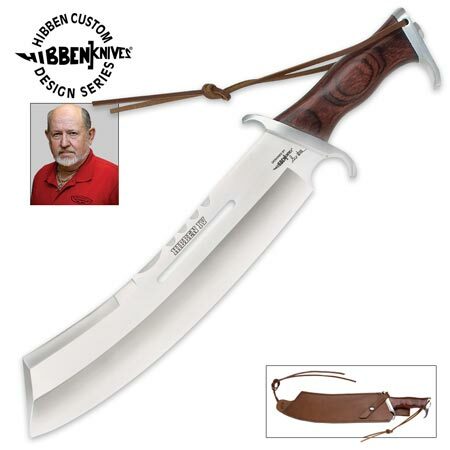 These knives also have an inscription on the blade that says Hibben Knives Custom Design. The grip is manufactured of stainless steel and features a silver-colored wire wrapping around it. Knife includes a custom leather belt sheath with a snap closure. 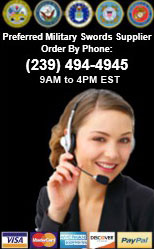 Buy the Highlander Bowie Knife for $69.99. Hibben IV Machete Knife has a stainless steel blade and stainless steel guard. These knives measure 17 ½ inches in all. They feature a 12 inch sharpened machete style blade. The blade has Hibben IV inscribed on the blade along with an inscription that says designed by Hibben Knives. Designed by master knife maker Gil Hibben, it includes a custom leather belt sheath with a snap closure. The handle is crafted of a heavy duty laminated wood. Buy the Hibben IV Machete for only $89.99. Gil Hibben III knife sale is similar in style to the officially licensed knife from the third Rambo movie. The Gil Hibben III knife is 16 ¼ inches in all with an 11 1/8th inch, stainless steel sharpened blade. These knives feature a laminated hardwood handle with a stainless steel guard and pommel. Each knife includes a top grain, custom genuine leather sheath with a leg tie. 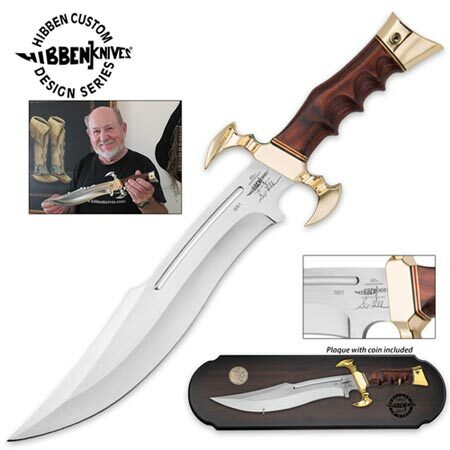 Gil Hibben is famous for being the original designer and knife maker for Sylvester Stallone movies including the Rambo film series and the Expendables movies. Buy these Gil Hibben 3 large bowie style knives for $89.99. Hibben Master Bushcraft Machete is 16 ¾ inches in all. These popular full tang knives feature an 11 3/16th inch 1075 carbon steel blade. The blade has as a rough-forged style finish with a satin finished cast stainless steel guard. The walnut hardwood handle features nickel silver pins and a comfortable grip. The Bushcraft includes a heavy duty nylon sheath with a PVC blade liner, lashing grommets and lashing Paracord. 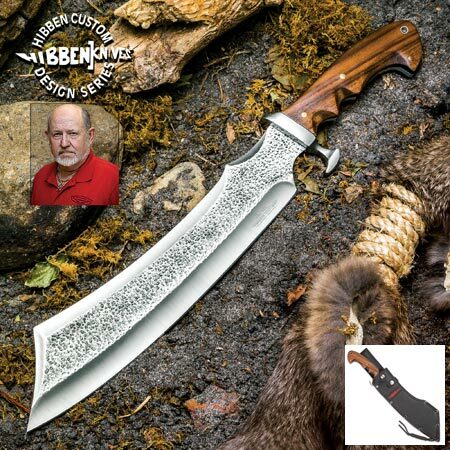 Buy the Hibben Master Bushcraft Machete for $99.99. 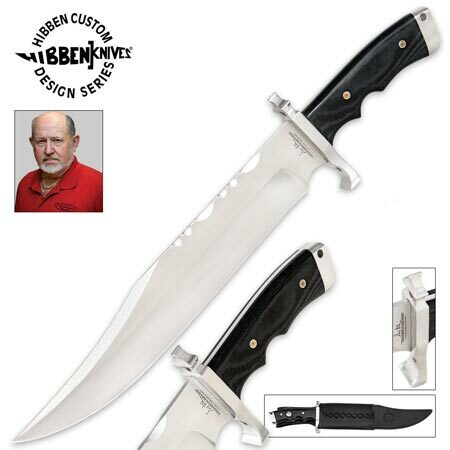 Hibben Magnum Bowie Knife is18 ¼ inches in all. These widely popular bowie knives are designed by famous knife maker Gil Hibben. 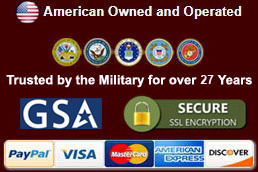 They have a robust 12 ½ inch 3Cr13 rust-resistant stainless steel blade. The blade is flanked by a shiny stainless steel guard and pommel. The black Micarta handle has decorative pins. These bowie knives include a leather body sheath with a belt loop. Buy the Hibben Magnum Bowie Knife for $99.99. Expendables 2 Toothpick Knife is 17 ½ inches in all. 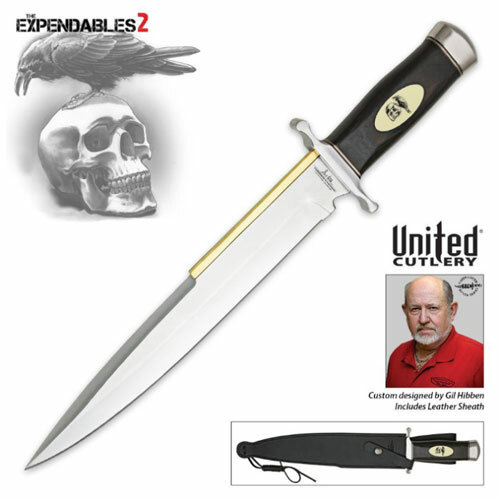 The Toothpick Knife was design by Gil Hibben specifically for Sylvester Stallone for use in movie The Expendables 2. This custom designed Old West toothpick knife features a classic Arkansas toothpick style blade and a traditional hardwood handle. 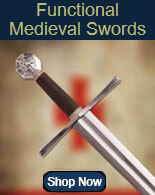 They have an oversized guard and pommel and feature a synthetic ivory inlay. The 11 7/8th inch blade is made of mirror-polished 3Cr13 stainless steel. 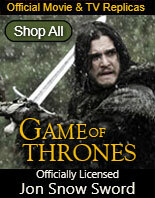 These official movie collectibles include an embossed leather sheath. 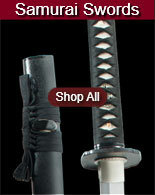 Buy The Expendables 2 Toothpick Knife for $99.99. 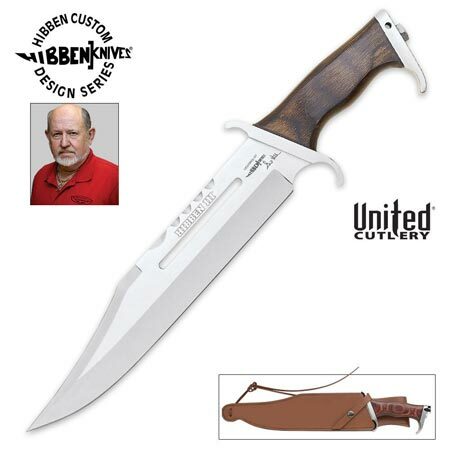 Gil Hibben 60th Anniversary Hibben Legend Bowie Knife is 18 inches in all. These limited edition knives are a must have for any Hibben knife collector. They feature a 12 inch highly polished 3Cr13 stainless steel blade that is engraved with the Hibben logo and Gil Hibben’s signature. The finger grooved Pakkawood handle contrasts against the gold color cast metal alloy guard and pommel. The free wooden display plaque features a 60th Anniversary coin. The bronze coin features a beautifully rendered 3D portrait of Gil Hibben. These 60th Anniversary collector grade knives are a limited edition and will not be mass produced. 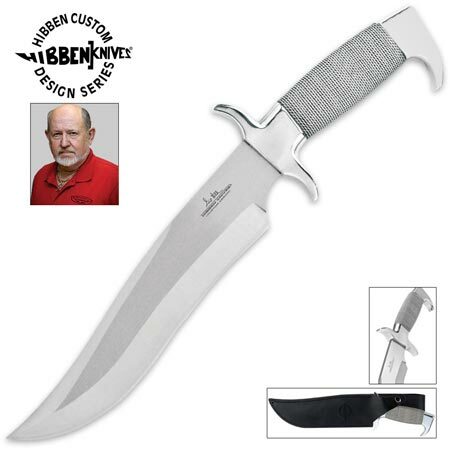 Buy the Gil Hibben 60th Anniversary Hibben Legend Bowie Knife for $129.99.